Happy Monday friends! It has been cold, rainy, and all over not great weather around here. When it's cold outside, I love cooking comfort and cozy food like casseroles, soups, and pasta dishes. 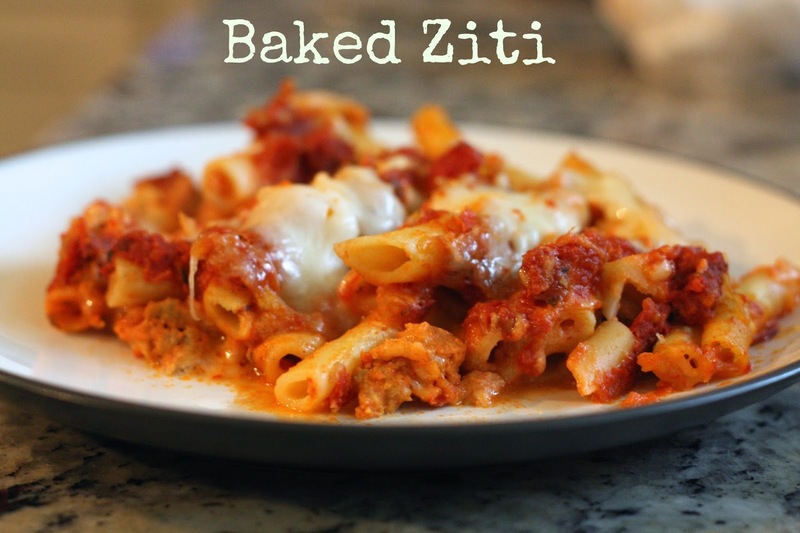 As part of my attempt to break out old recipes I haven't made recently, I whipped up a Baked Ziti dish last week. This recipe came from one of my old neighbors who made it for me after Boo-Boo was born and it makes enough for two medium-ish casserole dishes. I usually bake one and freeze one, but we were scheduled to take dinner to some friends that just had a baby, so it was a win/win for both families. It takes a little more prep than I usually like to put into meals (maybe you remember when I confessed my love pre-made meals HERE ), but this dish is worth the extra time and having another dish to freeze and pull out at a later date is an added bonus in my book. That's what I like to call home-made pre-made. Cook ziti noodles as directed. Saute diced onions and garlic. To the same pan, add and brown meat. In a large bowl, combine ricotta cheese, 1 jar of marinara sauce, 2 cups of mozzarella cheese, 3/4 cup of shaved parmesan cheese, pinch of salt/pepper, and cooked meat/onions. After draining cooked noodles, return to pot and mix with sauce/cheese/meat mixture. Pour into baking dish (2 since this recipe makes a lot!) and top with remaining sauce, mozzarella and parmesan cheese. This will be dinner tonight on our snow day! Thanks for the recipe!! !